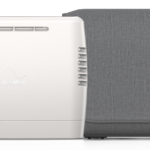 The SimplyGo portable oxygen concentrator is the latest edition to the respiratory product line from Philips Respironics. Recognized immediately as an improvement over the EverGo, the SimplyGo is gaining popularity since receiving FAA approval effective November 1, 2012. The SimplyGo comes standard with the SimplyGo concentrator in an attractive carry bag, matching accessory bag, AC and DC adapters for home and car, one (1) rechargeable battery, and a mobile cart. Most retailers will provide additional batteries at a discounted price when you add them to the purchase of your SimplyGo. Other optional accessories include a desktop battery charger, humidifier bottle pouch, and airline power cord. 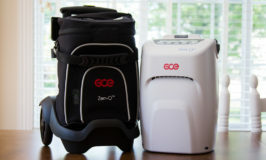 What makes the SimplyGo stand out from all other portable oxygen concentrators available on the market today is that it provides a continuous flow setting up to 2 LPM in a unit that weighs only 10 pounds. Until the arrival of the SimplyGo, one could not get a continuous flow unit under 17-20 pounds. Lightest POC that delivers up to 2 liters continuous flow – only 10 lbs. Battery time – 3.3 hours on pulse setting 2; only 45 minutes on 2 LPM continuous. All portable oxygen concentrators have shorter battery times when set on continuous flow because the motor must run harder to produce higher levels of oxygen. However, the small size of the SimplyGo battery makes the continuous flow setting almost useless when on battery power. So if you need continuous flow only and night, when you would likely have access to an electrical outlet, then the SimplyGo is still a great unit. Too heavy to carry – We all have dreams of a portable oxygen concentrator providing continuous flow and still being under 5 pounds. For now the SimplyGo is as good as it gets. However, 10 pounds is still pretty heavy to carry, and the mobile cart would be necessary for most oxygen users. So if you’re looking for a super-portable unit that you can carry, you must still turn to the pulse-only models. One exception: one company, OxiMedical, offers a mesh carry backpack that will hold the SimplyGo, as an option for those who are able to handle the weight on their back. Higher settings are a bit misleading – Like its predecessor, the EverGo, the SimplyGo’s higher pulse settings of 5 and 6 are a bit misleading. Yes, it can product sufficient oxygen for those settings; however, it can only keep up the demand for 15 breaths per minute. Since most people breath around 20 breaths per minute, the SimplyGo will max out its oxygen capacity for many at the higher settings. The SimplyGo works best for oxygen users who need 4 liters or less. All-in-all, I like the SimplyGo and would not hesitate to recommend it to many oxygen users.